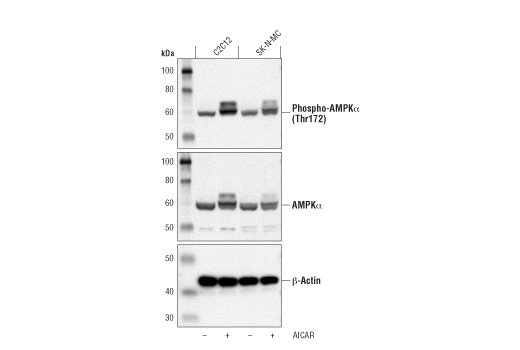 Western blot analysis of extracts from C2C12 cells and SKN-MC, untreated (-) or treated with AICAR (+) at 2mM for 24 hours, using Phospho-AMPKα (Thr172)(40H9) Rabbit mAb #2535 (upper), AMPKα Antibody #2532 (middle), and β-Actin (D6A8) Rabbit mAb #8457 (lower). This product is for in vitro research use only and is not intended for use in humans or animals. This product is not intended for use as therapeutic or in diagnostic procedures. AICAR is supplied as a lyphophilized powder. For a 75mM stock, reconstitute the 25 mg in 1.29 ml sterile diH20. Heating to 37C and/or additional vortexing may be required. Working concentrations and length of treatment can vary depending on the desired effect, but it is typically used at 0.5-2mM for 30 minutes-24 hours. Please note: Appearance of AICAR solution should be a clear to yellow/brown solution without precipitation. If precipitation is observed, warm tightly capped vial at 37C until AICAR goes into solution. Agitation of warmed solution by vortex may be necessary. Store solution at -20ºC. Protect from light. Use within 12 months to prevent loss of potency. Aliquot to avoid multiple freeze/thaw cycles. AICAR (5-Aminoimidazole-4-carboxyamide ribonucleoside) is an adenosine analog taken up by muscle and phosphorylated to form 5-aminoimidazole-4-carboxamide-1--D-ribofuranosyl-5'-monophosphate (ZMP), which stimulates AMPK activity and glucose transport in skeletal muscle (1). AICAR has been used in studies measuring glucose uptake, diabetes and insulin resistance, and energy regulation during exercise. AICAR acts by entering nucleoside pools and significantly increasing levels of adenosine during periods of ATP breakdown (2). Sakoda, H. et al. (2002) Am. J. Physiol. Endocrinol. Metab. 282, E1239-E1244. Mullane, K. et al. (1993) Trends Cardiovasc Med 3, 227-34. Jakobsen, S. N. et al. (2001) J. Biol. Chem. 276, 46912-46916. Jessen, N. et al. (2003) J. Appl. Physiol. 94, 1373-1379. Giri, S. et al. (2004) J. Neurosci. 24, 479-487.